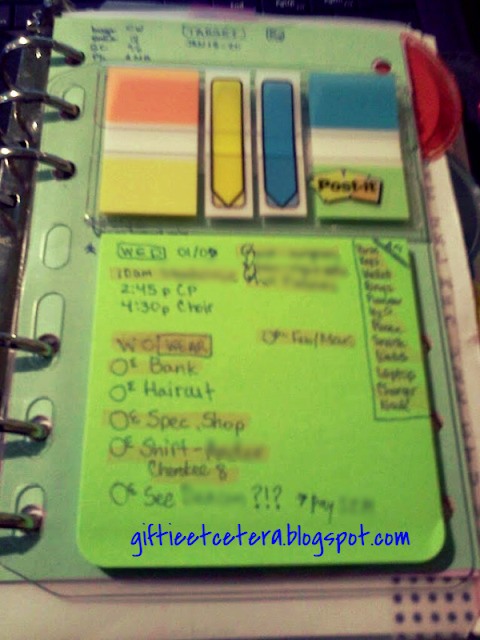 Lately I've been posting about different ways to make your daily docket. A daily docket is just your plan for today. Last night, when I made my computer docket, I realized that, due to a doctor's appointment, I'd be away from the house all day. Some time would be spent at the computer and at home, so computer and home tasks (like sharing my blog or taking down my Christmas decorations) were put on my computer daily docket. So today, I'm trying something a little different. In addition to my e-daily docket (made in OneNote 2013) for those working mainly on computers like my Microsoft Surface Pro 3 , I am making a more portable docket for myself, limited to stuff that I need to take care of away from home or my computer. I added a sticky note page to my dashboard and am using it as a dashboard docket for the day. Whatever doesn't get done is just stuck on my keyboard to complete at home and I only have to look at my dashboard instead of opening my whole planner. Where are you doing your daily dockets? Is it working for you? My hand is up...actually both hands. The boxes will be too heavy for me to lift. That's my excuse, and I'm sticking to it. I have taken down the wreaths. That task was in my planner. The rest are scheduled for Saturday. Might need a Docket for that job. I just took down my tree and wreath on Wednesday night. Still have everything littered around my living room though.